April 2 has been declared World Autism Awareness Day (WAAD) by the United Nations General Assembly. On the eve of this special day, Mayor Ko Wen-je went arrived at Civic Plaza to join in an activity where he waved a blue wand and a blue ribbon. The mayor listed the “Five Mutuals” in hopes that those with autism could live happily together with everyone else in Taiwan’s inclusive society. 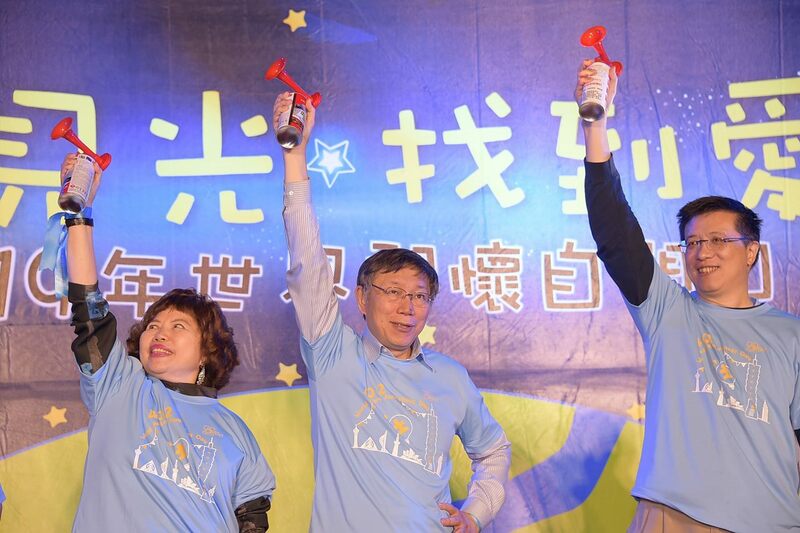 Mayor Ko pointed out that the Foundation for Autistic Children and Adults in Taiwan (FACT) has, for seven years in a row now, surrounded Taiwanese landmarks such as the iconic Taipei 101 with a chain of blue lanterns. This year, the Office of the President, Xinyi shopping district, and LEECO Outlet are surrounded in a festive activity of blue lanterns and blue ribbons, which signal support for the autism cause. The mayor said in many cases, autism may not be immediately visible as it is a linguistic and emotional barrier that causes difficulties in interpersonal communication and interaction. Therefore, part of FACT’s mission is to continually disseminate information online to raise awareness and understanding. Ko stressed that if autism can be diagnosed early, treatment can be more effective. But the most important thing is that people develop more understanding and learn how to interact with people with autism. Bridging the gap of understanding is something Mayor Ko has encountered when his son has emotional problems: his behavior may seem strange at first, but not after an attempt has been made to understand him. Therefore, the mayor expressed his hopes that this activity makes people aware that, with autism, you are different, but that doesn’t matter: as long as you can understand one another, you can get along. Adding that Taiwan must become a diverse and open society, Ko remarked that diversity is about understanding. Like the “Five Mutuals” he often mentions: knowing one another, understanding one another, respecting one another, working with one another, and accepting one another. These “Five Mutuals” can be applied to almost every situation. He believes that the “Five Mutuals” help people know that a person has autism, then understand them, respect them, work with them, and, even if it is a new experience, accept them. Finally, Ko expressed his hopes that those with autism can live happily together with everyone else in Taiwan’s inclusive society.